The lovely folks over at RawSpiceBar sent me some delicious spices to check out! Anyone who knows me knows how much I love these types of subscription “surprise” boxes and I was actually over the moon that they sent me TWO of the September batch. This means one set for me…and one set for YOU. The September batch had Sun Dried Tomato Pizza (featured in this recipe), Dark Coffee and Chiles (which I plan to use on steak tacos next week! ), and Chipotle Smoked Salt. I can attest that RawSpiceBar sources the highest quality and some of the most unique spices from around the world. 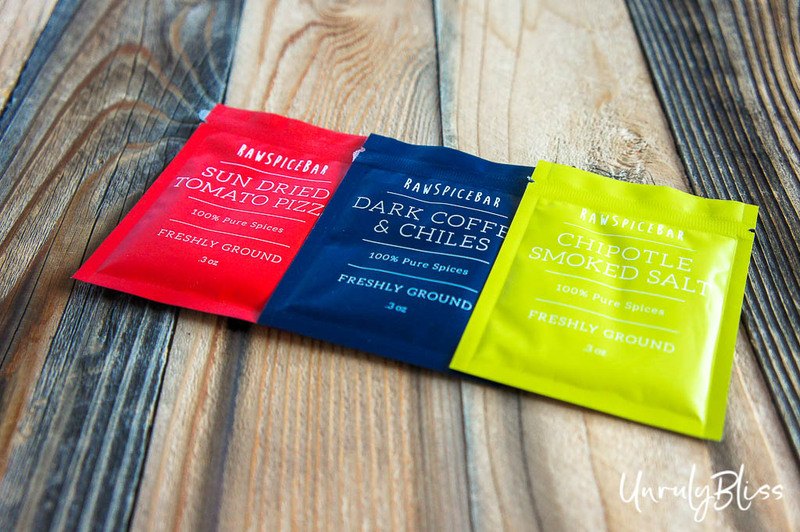 Their spice blends are created by top chefs and expertly toasted, ground, and blended for maximum flavor. I LOVE that instead of searching at various stores for that one random spice I’ve never had before – and paying an arm and a leg, I can pay a flat $8 a month for three new spices delivered right to my door. Sign up on their site, fill out the Flavor Profile Quiz, and receive 3 freshly ground, recipe-ready flavor kits, direct to your door each month. The spice packets come with enough to make meals for 3 to 4 people AND they come with suggested recipes, just in case you want to do something tried and true with what you received. Think global people. Think delicious. Think RawSpiceBar. Now for the panini…so good. So, so good. Prep your grill for use at medium-high heat. In a medium-sized pan, melt the butter over medium heat. Add the shallots and sprinkle them with salt. Stir them around to coat them in the butter. Begin prepping your chicken for grilling by sprinkling it with salt and pepper. Return to your shallots every minute or so for a quick stir. When shallots have wilted and softened, lower the heat to medium low. Continue to stir them every few minutes for approximately 20 minutes. The shallots will be done when they look wilted and golden brown, but not crispy. 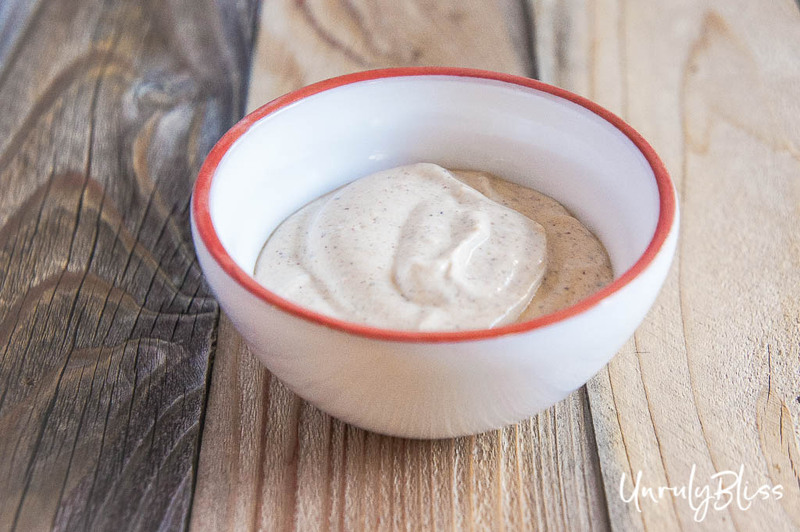 While the chicken is grilling and the shallots are cooking, mix together the plain Greek yogurt, sour cream, and spices to make the spread. 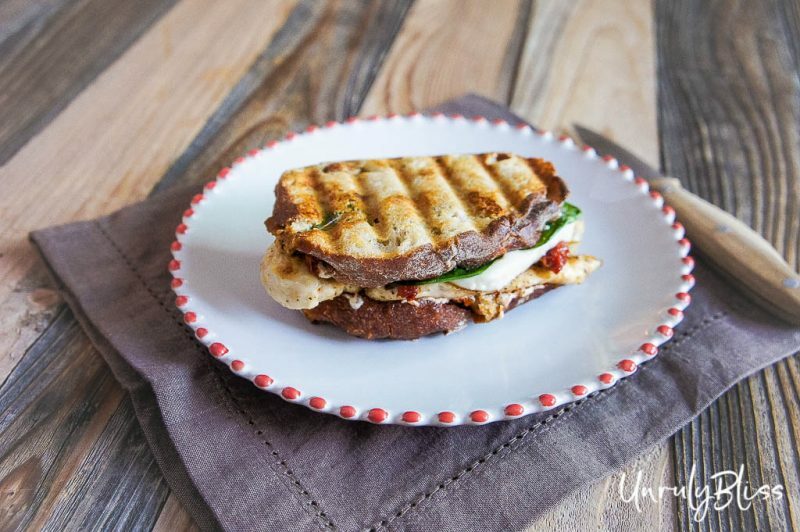 Now is a great time to turn on your panini press so it’s ready when you are. To assemble the sandwiches, smear one tablespoon of the spread on each slice of bread (on one side only of each slice, obviously). 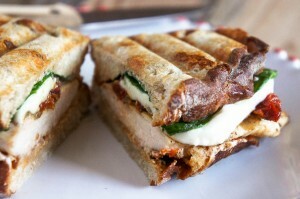 Next, layer some spinach leaves, caramelized shallots, and sun-dried tomatoes on one slice of bread per sandwich. 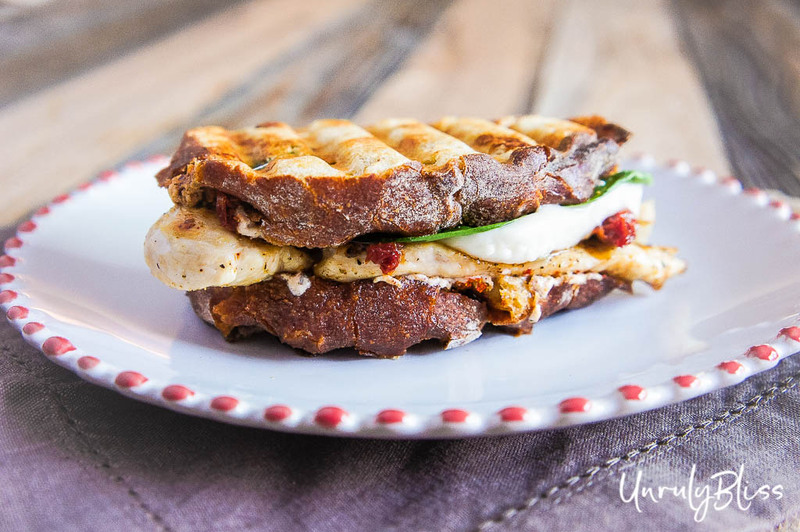 Top the sun-dried tomatoes with the mozzarella slices, the chicken, and lastly, the other slice of bread with spread on it. Spray the top and bottom of your panini press with cooking oil and place one sandwich in the center, but more towards the back. I used a wooden spoon to sort of keep shoving it all back while I pressed the lid down, to keep it all together and in one piece. Heat the sandwich in the press, checking on the sandwich until the top looks golden and crisp (or to your preferred texture). 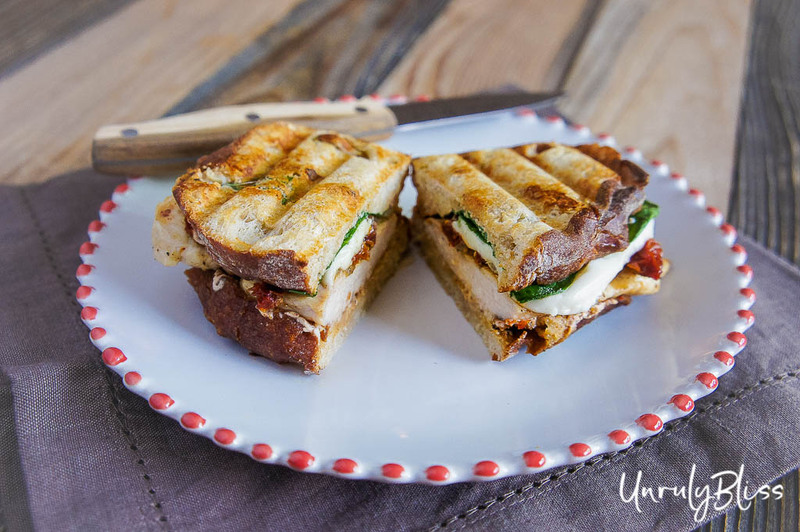 If you do not have a panini press, heat a medium-sized pan over medium heat on the stove-top. Spray it with cooking spray and place the sandwich in the center. Press the sandwich down with another heavy pan, plate, or lid, weighing it down with something heavy, or simply pressing it down with your hand while the sandwich cooks. 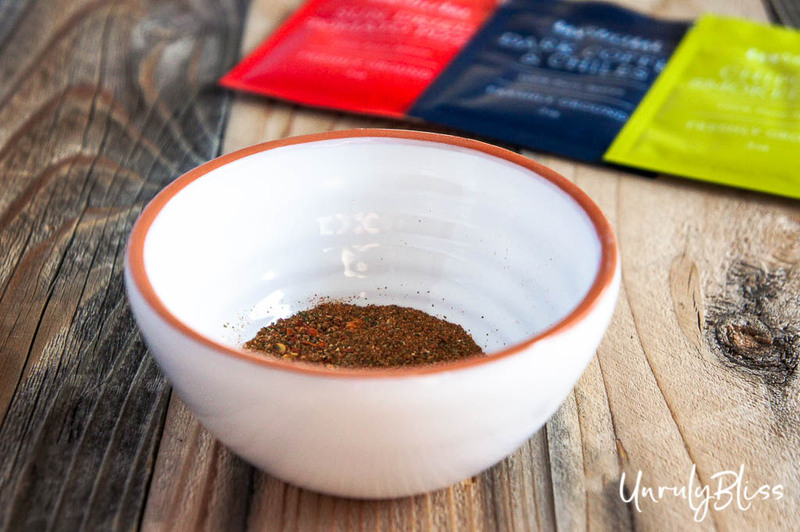 Enjoy the amazing deliciousness of sun-dried tomato goodness and the fantastic spices from RawSpiceBar! Recipe created in our own kitchen, with inspiration from RawSpiceBar spices! « Pumpkin Spice Cake and Happy Thanksgiving!